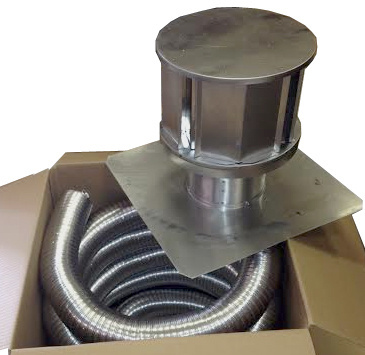 This kit contains two 3" diameter aluminum chimney liners plus chimney cap attached to the chimney flashing. 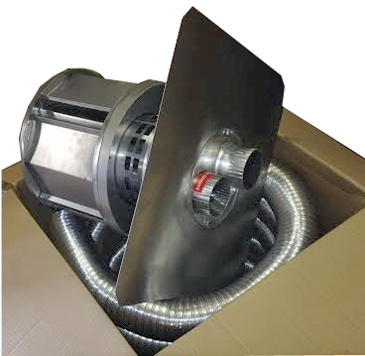 The liners attach to the insert, one connecting to the fresh air intake and the other attaching to the exhaust outlet. The liners attach to the connectors that are attached to the flashing. This is the same lining kit that's included with our gas inserts. * Flashing is 18" x 18"
This liner kit can ONLY BE INSTALLED WITH A GAS INSERT that has a 3" intake and 3" exhaust.